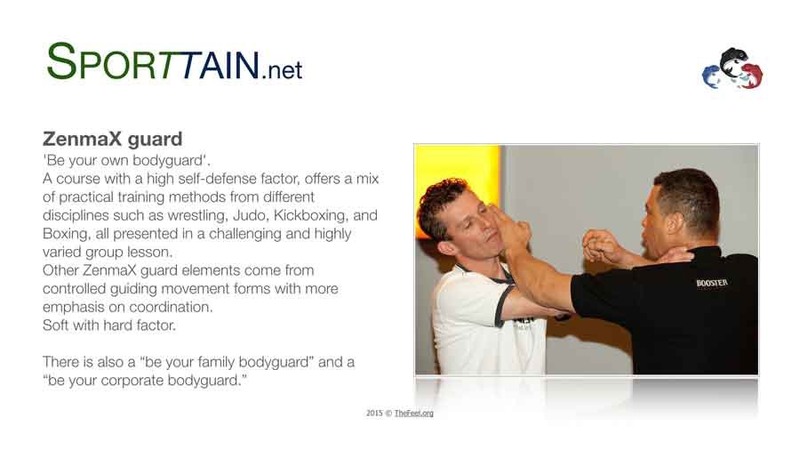 ZenmaX guard stands for ‘be your own bodyguard’ a response and mental empowerment training. One on one or together with a max 4 participants personal training, or with a motivated group of people m/f you start with proven principles from various martial arts to learn how to deal with unsafe and threatening situations, both inside and outdoors. With pleasant, physical exercises, coordination, speed, flexibility, strength, your endurance will be playfully improved: glad to work with your body and push together physical limits. A win win situation. Other ZenmaX guard elements come from controlled guiding movement forms with more emphasis on coordination, soft with hard factor. At the end of the course, you wish to extend your ZenmaX guard training to go deeper into what you have learned so far. This course with a large self-defense factor, is a mix of practical training methods from different disciplines such as wrestling, Judo, Kickboxing, and Boxing, all presented in a challenging and highly varied group lesson.